Buka Puasa Buffet at Marche, The Curve | Teefa Says..
Last Sunday was Raya cleaning for us at home. If you've been INSIDE my house, you'll know how messy it it. Try having 6 twenty-sumthing people under one roof, then you'll understand. 4 of them recently finished uni/college, 1 of them is a permanent resident, another one is crazy for shoes+clothes. So the house is full of stuff. Books and notes in the kitchen cabinets, countless shoes under the stairs, even the family space upstairs have been transformed into an attic coz we don't have enough space for our junks. Tak campur lagi dengan Wan yang super hoarder. Tsk tsk. So on Sunday we threw out some shoes, rearrange the 'attic', clean up our backyard, threw out some furniture, polish the vases, sweep, mop the floor, polish the furniture, threw out two mattresses.. The list goes on and on. Sudah la puasa. And i'm super allergic to dust. Sepanjang masa hingus meleleh dan bersin-bersin. Demi Raya, tabah kan jugak hati. To reward myself yang gagah melawan alergy dan gagah berpuasa, Mr. Chenta and i went to Marche for our Iftar date. Iftar at Marche is our annual thing. We've been going for three years now (thanks to Linda yang promote kat aku). This year, it's kinda special for us coz it's our first iftar date. And mungkin kah ini our last iftar date as a couple? Tahun depan as hubby and wifey pulak kah? Hehe InsyaAllah. The price has increased AGAIN this year (surprise, surprise!). In 2009, the price was RM45/pax. Time ni sumpah rasa murah gilaaaa. 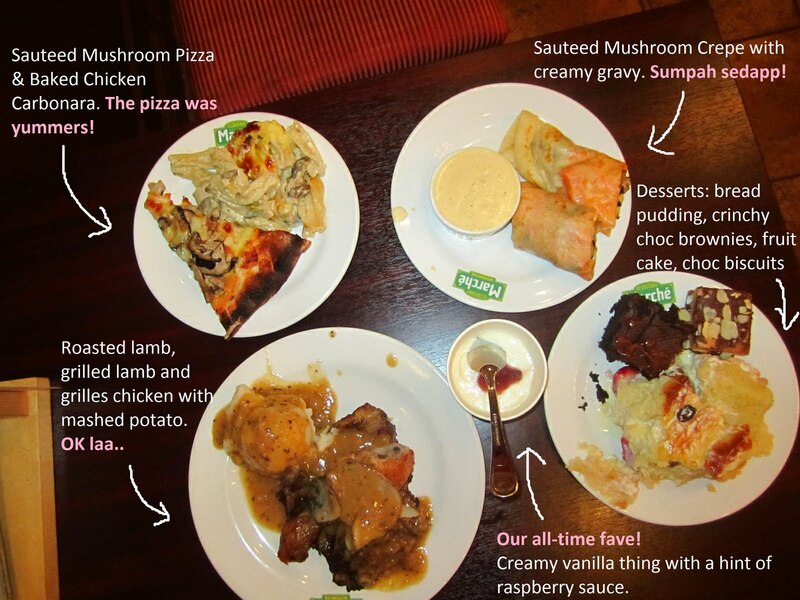 Ye lah, buffet at RM45, murah kan? Then last year it increased to RM58/pax. Still okay. But this year, harga sudah mencecah RM65 lah. Haiyooo. Itu buffet makanan aja. Drinks tak campur lagi ye. Tapi sebab terkenangkan makanan dia yang sedap-sedap belaka, tutup mata ajaa.. Name pon setahun sekali kan? On our way there on DUKE Highway. Weather was nice. The sun shone after a heavy rain. Mushroom soup Marche yang menjadi pojaan hatiku.. Dia adalah pekat, creamy and full of flavor! Muka tak sabar nak berbuka. Our second round and more. Tak larat makan, tak larat amek gambar dah! All in all, Marche's Buka Puasa Buffet was good. More selection compared to last year. 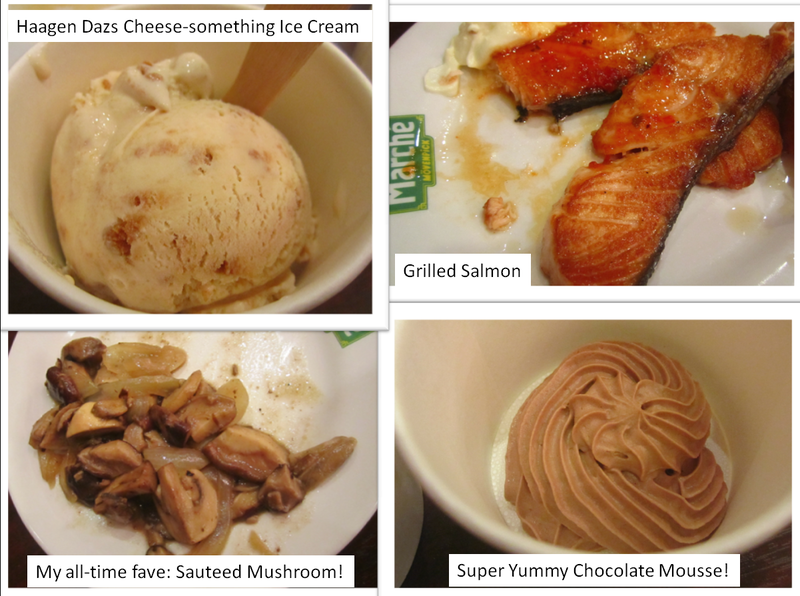 My favorites are the crepe, mushroom soups, all the desserts, pizzas, sauteed mushroom, rosti, and the grilled lamb. Yang lain-lain tu biasa je. For buka puasa, it's advisable to make a reservation as Marche's always packed. Request for a table inside the rooms (for example Locanda) as it's more comfortable. Last year we came for iftar with Linda and Butet. This year tak sempat nak janji-janji for double date. Kami pergi berdua je. Masa on the way gi The Curve, Mr. Chenta kata "Haaaa.. Ntah-ntah terserampak ngan Linda jap lagi.." Guess what? Memang masin mulut Mr. Chenta. Linda was there with Butet and anak buahnya, Kimi! Gaaahahaha.. Mr. Chenta and i couldn't stop laughing over it. Great tummies think alike. That's why we chose to go to Marche at the same time UNPLANNED! Dah nak kawen dah diorang ni. So happy for them! Dah abes makan, Mr. Chenta and i jalan-jalan kat Ikea pulak. Needed to buy a few things for Raya deco. Strangely i was in a cam whoring mood that night. Ini adalah jarang berlaku bila saya berusia 25 tahun ye. Agak pelik di situ. Kerusi ni selesa gila. i was gonna buy it for Wan tapi pengsan bila tengok harga. RM969 (if i'm not mistaken). Tak jadi beli. Sorry Wan. Lenkali ye.. The couple with weird faces. My dream walk-in wardrobe. i don't ask for much. i only want a wardrobe like this..
That's the story of our iftar date. That night, i came home happy. Little did i know that i'm gonna have a baddddd fever.